Photo(s) by Lucian PerkinsDavid Maraniss, an associate editor at The Washington Post, is the keynote speaker September 30. The quaint, little village of Harbor Springs is getting a new book festival this year, but there isn’t anything quaint or little about organizer Kate Bassett’s vision for the inaugural event. Bassett’s tapped the program director from the LA Times Festival of Books to pull in some nationally known authors for panel discussions, readings and other events over three days. “We think it’s going to surprise a lot of people. Here you have this little town with amazing beaches and scenery, but then you’re going to be able to hang out and talk with National Book Award finalists. We hope it feels coolly out of place.” One thing that’s equally cool: The organizers have made all but a handful of ticketed keynote events free. You can check out which of your favorite authors may be descending on the Harbor Springs book festival this fall (September 30 through October 2) at hsfotb.org. 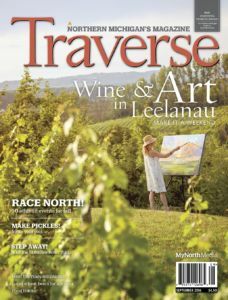 This Up North Arts & Entertainment feature was originally published in the September 2016 issue of Traverse, Northern Michigan’s Magazine. David Maraniss is the keynote speaker Friday, September 30. David will speak at the Harbor Springs High School Performing Arts Center at 7:30 p.m. Tickets to the Harbor Springs book festival event cost $40 and include his book Once in A Great City.